It's been gloomy, rainy and chilly all week; fall is right around the corner here in Alaska; that also means it is berry picking time!! Today I whipped up a batch of red currant - raspberry jam which is picky-picky husbands all time favorite. 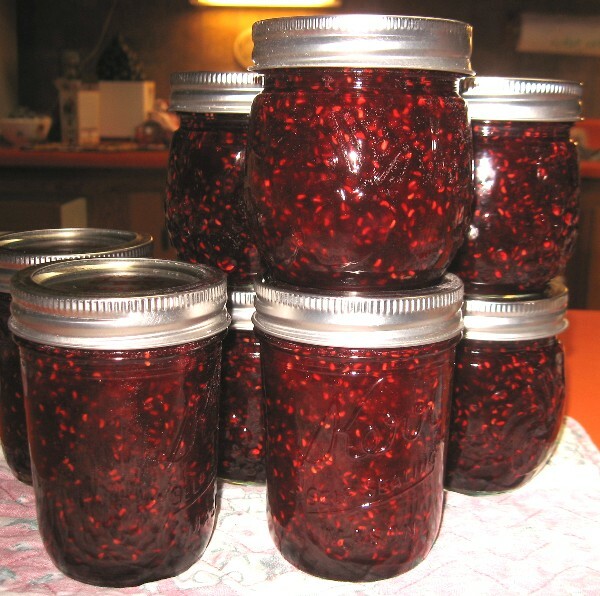 Lucky for us, these berries grow in the woods around our house and I've been using them to make this jam for over 35 years now. Hubby likes this recipe so much that HE picks the berries without me asking him to!! The red currants really brighten up the raspberries and the combination is simply delicious (and gorgeous)!! Add the raspberries and sugar to the currant juice and bring to a hard rolling boil (one that can not be stirred down); boil for one full minute minute exactly (stirring constantly). Remove from heat and stir in liquid pectin until well mixed; skim off any pinkish foam (throw the foam away). towel and put on the lids. Process in a hot water bath for 10 minutes. 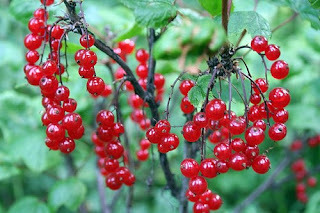 In the woods around our house, we have raspberries, red currants and high bush cranberries. My first jelly making "adventure" (a million years ago) involved high bush cranberries (they grow in profusion around here and they are a lot of fun to pick). Thinking that I had hit the "berry mother lode", I was so proud of my huge harvest. It wasn't until I started cooking them that I realized they weren't red currants (high bush cranberries smell like dirty gym socks when you cook them). 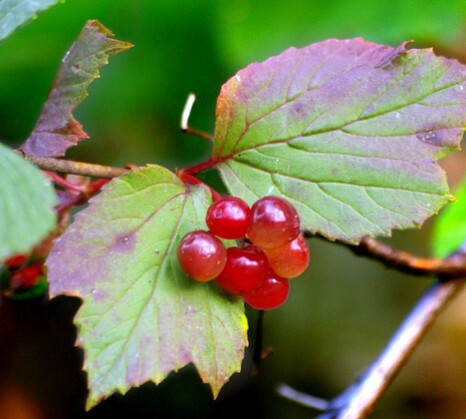 A lot of people DO eat high bush cranberries, but they usually mix them with other fruit to help mask the strong "sock taste". Let's just say I didn't make that mistake again, lol !! NOTE: It is always a race between us and the birds for these red gems. If I wait until they are ALL ripe, the birds usually win, so I pick and freeze....pick and freeze, until I have enough for a batch of jam (these berries freeze VERY well). 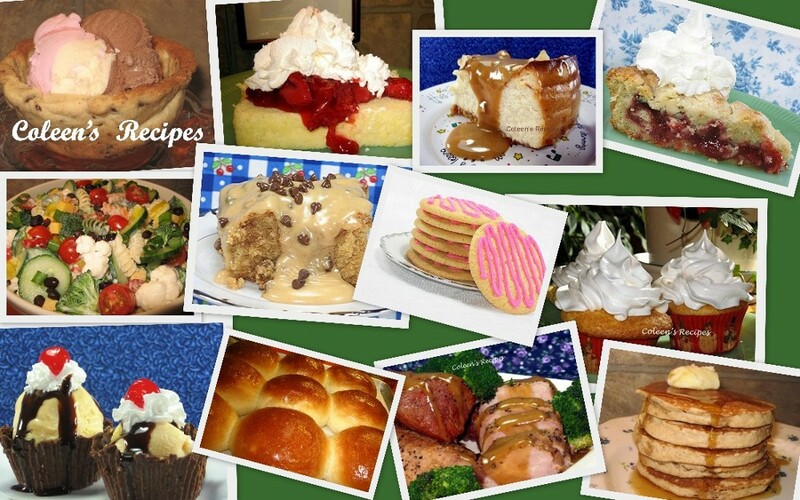 NOTE: This recipe uses a liquid pectin called CERTO. I'm guessing that a powdered pectin would work well, but I've never tried it with this recipe. 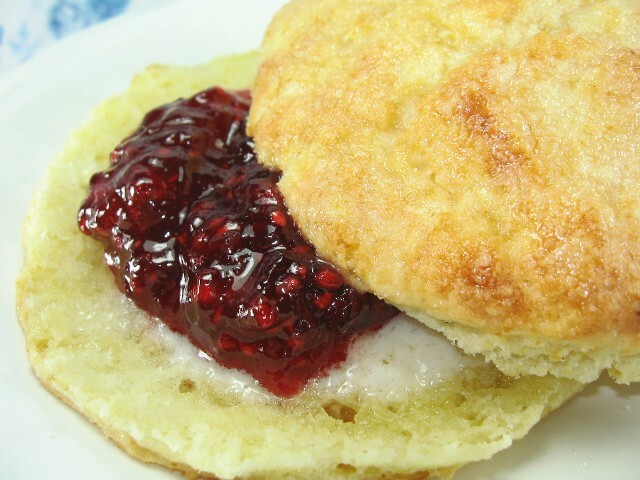 It takes 1½ pouches of liquid pectin (1½ pouches = 1/2 cup). If you use the powdered pectin, make sure you follow the cooking instructions on the box.